I currently using fastai v0.7 and I am running it on Google Colab. By the way I am implementing the techniques taught in lesson 2, I encountered the following error when running learn.fit(). Does anyone have any idea on the cause? 3380 around : equivalent function; see for details. 64 # a downstream library like ‘pandas’. I’m running lesson 14 enhance and I’m facing the same issue, which I never had, I didn’t found the solution yet. I am facing the exact same issue. I am just trying lesson 2 techniques in other Kaggle datasets. Please, publish here the solution if you find out. I just got a similar error while running some code within Kaggle that worked yesterday. Based on all that I think Cesare is right in that some package was updated that doesn’t work with fastai 0.7.0. If I figure anything out I’ll post here as well. I face the same issue trying to learn resnet34 on my own dataset. I just hit this problem today. I looking at the numpy release notes, version 1.16.0 was released just over a week ago. I’ve created a jupyter notebook locally and everything worked (fastai 0.7 I guess), afterwards uploaded notebook on kaggle and I got the same error. 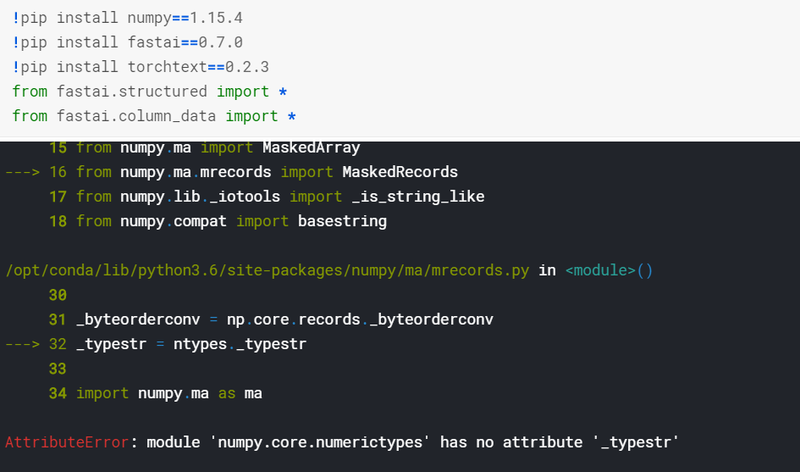 I tried to change numpy version but then I get a different error when importing fastai. I’m pretty sure this error is caused due to the wrong version of numpy, but can’t find a solution. Previously I tried 1.15.1 and 1.15.3 with the same outcome. Would be great if I got the solution before 30th January bc that day the competition ends. Please reply if somebody has solved this, thanks in advance. Same here, for some notebooks it works, on some others trigger that error. I’m still facing the same issue. Any final solution that works? Please may i know what was the pytorch version you used? I got stuck on this too with the fastai/courses/dl2/carvana.ipynb notebook. 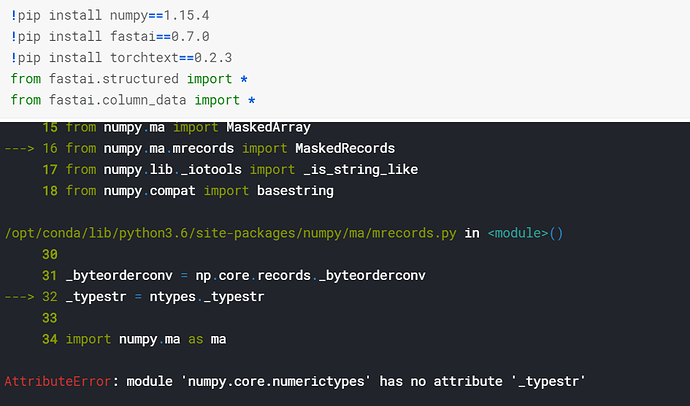 Following on what the other commenters have mentioned, I went into my fastai/environment.yml file and changed the two entries for numpy from just - numpy to - numpy=1.15.1. After that I ran the command conda env update -f environment.yml and that fixed this error. conda env create -f environment-cpu.yml (for gpu version conda env create -f environment.yml) and then conda activate fastai-cpu. Now run jupyter notebook and things should work normal. It took me a lot of days to run all of the fit() commands, please help me if you have these model files, thanks.